Applications are currently being accepted for a scholarship available through the Indiana Construction Association’s Building Division-ICA Scholarship Fund and/or Highway, Heavy and Utility Division – ICA Scholarship Fund. Administered through the Central Indiana Community Foundation (CICF), the purpose of both scholarships is to encourage interest and participation in Indiana construction industry careers. Applications and guideline information are available by calling the ICA Office at (317) 472-6777, CICF Scholarship Student Information Line at (317) 631-6542, ext. 279 or via the web at www.cicf.org/page26452.cfm. Mark your Calendars! JH Rudolph & Co., Inc. will be hosting an Open House event at the facility located at 901 E. Columbia Street on Friday, March 18 beginning at 11:00 am. A delicious lunch and great prizes will be available for everyone who attends. J.H. Rudolph & Co., Inc. is excited for the opportunity to showcase the services we offer and quality work we have completed to date, as well as give our customers, vendors, partners and municipal contacts an up-close look at what J.H. Rudolph has to offer. Invitations will be sent out with more information in the near future. J.H. Rudolph & Co., Inc. is proud to support Carver Community Organization, a local organization with a mission to promote a healthy and safe environment that teaches respect for self, others and the community. The organization offers childcare, after-school and senior programs that benefit many of Evansville’s citizens. To show our support of the Carver Community Organization, J.H. Rudolph & Co., Inc. sponsored “Melodies for Martin”, an event that celebrates the legacy of civil rights leader Martin Luther King Jr. while raising proceeds to benefit the works of the Carver Community Organization: child care, after-school programs, tax assistance and job skills training, and more. For more information on Carver Community Organization, visit www.carverorg.org. J.H. 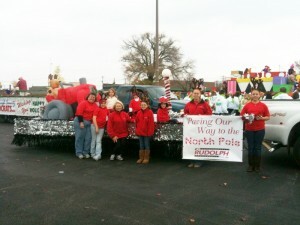 Rudolph & Co., Inc. recently participated in the Downtown Evansville Holiday Parade with a stunning float entry titled, “Paving Our Way to the North Pole”. Employees and their families spent alot of time creating, building and walking with the float on parade day. It was a lot of fun! Special thanks to employees Stephanie Forney, Becky Fitzsimmons, John Gelarden, Steve Gelardent, Gary Hoffman, Peter Bjorkman, Angela Kifer, Rosemary Hall and their famililes for participating! We couldn’t have done it without them. You are currently browsing the J.H. Rudolph and Co., Inc. blog archives for January, 2011.